The Medici Chapels are right back the church of San Lorenzo in Florence. The museum consists in the wide Crypt, where the Medici family members are buried, that leads to the Chapel of Princes. The octagonal chapel, decorated with semi-precious stones and rare marbles inlaid from the Opificio delle Pietre Dure (Semi-precious Stones Workshop), hosts the impressive funerary monument of the Medici Grand Dukes of Tuscany. The decoration of the New Sacristy was first realized by Michelangelo on request of Medici Popes, Leo X and Clement VII. Before he went to Rome, he began to design the architecture and the sculptural decoration of the funerary monuments of the Medici family too, as Madonna and Child, on the tomb of Lorenzo the Magnificent and his brother Giuliano. 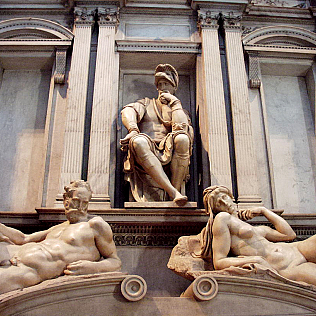 The New Sacristy was arranged and finished by Giorgio Vasari and Bartolomeo Ammannati. Along with the sculptural and architectural decorations, the museum displays the Treasure of the San Lorenzo Basilica: reliquaries and liturgical objects, great examples of Renaissance and Baroque goldsmith’s art.